The Montreal Canadiens are exploring the market for Karl Alzner, who was recently demoted to the AHL after seeing his role diminish this season. Rumour suggest as many as four teams have kicked tires on Alzner, but with three more years at $4.6 million, it's not an easy trade to make. 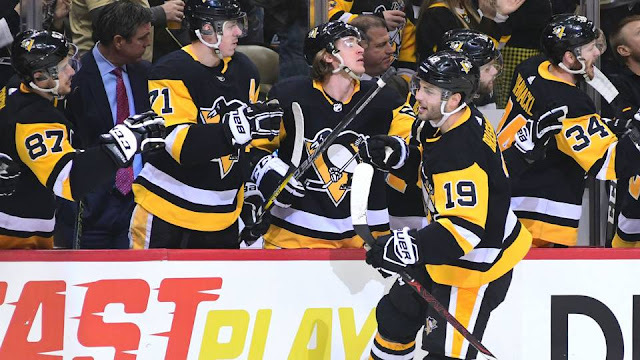 Reports suggest the Penguins may be looking to make another move in the near future - once again to their forward group. Derick Brassard hasn't been a great fit in Pittsburgh, and it appears patience may be running thin. The 3rd line pivot is probably a better fit in a team's top 6, so there would be no shortage of suitors if and when the Penguins explore the market. A team like the Jets might make some sense, given their desire to add another center before the deadline. The William Nylander saga has come to a merciful end after the two sides reached a deal just minutes before the 5:00 PM deadline on Saturday. His 6 year, $6.9 million dollar cap hit is a little more than the team wanted, but not disastrously so. Nonetheless, someone is likely going to have to get shipped out as soon as this summer to make room for the combined extensions of Nylander, Marner and Matthews. Early speculation points towards Patrick Marleau as one possibility, though his $6 million cap hit next season may be tough for some teams to absorb. The other route, as has often been rumoured, is the Leafs trading Nylander himself. With the player secured to a 6 year deal with no trade protections until year 6, the offers are only going to get better. Time will tell if that's a path the team has to take - GM Kyle Dubas has indicated the opposite thus far. Teams around the league that were waiting on Nylander - Carolina a Philadelphia chief among them - remain antsy for a roster shake up. Keep an eye out for moves in the stretch towards the February 25th NHL trade deadline. Alex Martinez' name has been circulating around the NHL rumour mill for well over a year, and the latest speculation connects him to the Tampa Bay Lightning. The 31 year old has 3 years remaining at a reasonable $4 million a season. With the Kings likely sellers at the trade deadline, expect to hear many more names surface.